This chalet is a LUXURIOUS retreat with outstanding amenities boasting over 2600 square feet on three full levels. It is located on almost three acres and is extremely private. You have almost the whole side of a mountain to yourself! It is located in a private, gated community and has panoramic mountain views from every room in the house. You can view three states from our three levels of balconies. The house is fully furnished with luxury amenities and tastefully decorated. It features 4 full bedrooms, 3 full baths along with two queen sleeper sofas for additional sleeping accommodations. The cabin offers a private master suite upstairs featuring a king size red cedar log bed with a custom 'Spa experience ' shower in the master bath as well as a private balcony off the master bedroom. The main level boasts two separate bedrooms with one featuring a queen bed and the other featuring two twin beds as well as a full bath. The basement level offers a fourth private bedroom with a queen bed as well as a queen sleeper sofas for additional sleeping accommodations. Additionally we have satellite television on all three levels of the home. We also offer a DVD movie library to choose from. The basement is an entertainment level featuring a bar, pool table,air hockey table, foosball table, board games, hot tub (unavailable in colder months due to freezing temps) and a book selection for both children and adults. We are a 10 minute ride to downtown Murphy and shopping areas with paved roads leading to the property. House features unlimited high speed internet access on our computer or use the Wi-Fi setup on your laptop or wireless device! PLEASE NOTE: THE MINIMUM RENTAL AGE FOR OUR HOME IS 25 YEARS OLD. NO PARTIES OR GROUPS OF 24 OR YOUNGER MAY RESERVE THIS CABIN. THE PERSON SIGNING THE RENTAL AGREEMENT MUST BE A MINIMUM OF 25 YEARS OLD AS THEY ARE RESPONSIBLE FOR THE RENTAL PROVISIONS AND ARE SUBJECT TO FEES DUE TO DAMAGES OUTLINED IN THE RENTAL AGREEMENT. Here are some 360 degree photos that you can pan around in. Copy and paste the link, once the picture opens click on it then you can drag the mouse around to rotate. We are the owners and caretakers of this beautiful home. We enjoy this cabin as our vacation home as well and try to provide our guests with all the comforts and conveniences of home and then some! 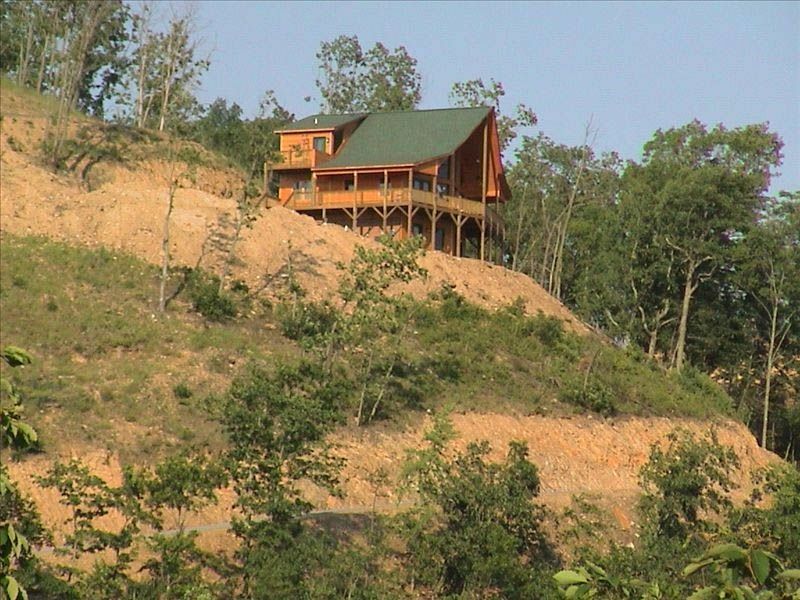 This cabin was built at this location for its convenience to downtown Murphy without compromising the unbelievable views and privacy available. All within a gated community. We love to sit on the deck and look out at the breathtaking views of the mountains. We always have a ton of fun with our family and friends because of all the amenities the cabin has to offer. There is plenty of room in the home and even if there is more than our family, we have lots of room to stretch out and not constantly be under each other's feet. Enjoy unbelievable views of 3 states while you relax in the hot tub. (Hot tub is unavailable in winter months due to freezing temps). This cabin surpassed all expectations I had! The pictures don’t do it justice at all. It was clean and there was information about things to do in the area, which helped me a lot. I live in very flat Florida, so the drive up to the cabin was intimidating, but once high above the clouds you feel above it all. The views are breathtaking! Thank you so much for allowing myself and kids to stay at your beautiful cabin! We’d definitely use it again if in that area! This was our second stay here and it wont be our last. You cant find a better view for any price! Thank you John! We really appreciate your kind words and look forward to another opportunity to have you as our guest! Amazing views and spacious cabin! We had a wonderful time here! The views are incredible- the website pictures don’t do it justice!!! The “wake up and sit up in bed” view from the master bedroom is breathtaking! The cabin was spacious and well-stocked. The games downstairs were a big hit. We highly recommend the Fires Creek Recreation Area and the Murphy Riverwalk. Dinner at Rib Country BBQ was delicious and tons of food. Highly recommend this cabin! The cabin was great. It was one of the best cabins I have ever stayed in. It was very clean, easy access from the local town, and some of the best views I have ever seen. A couple of friends and I do a bro trip a couple times a year and this was a great find. We did a lot of cooking, watching games, poker, pool, and a few friends brought some instruments and we jammed. My brother and I went mountain biking at Piney Knob Trail which was one of the best riding trails. All in all, a great trip. Book this cabin, you will not be disappointed. So glad you enjoyed our mountain home! Sounds like you got do do a lot of fun activities! We greatly appreciate your review and certainly hope you will stay with us again! "a bit of heaven on earth"
We arrived in a blustery thunderstorm. The next morning we discovered views that people would think were fake, if painted and hanging on the wall... from three sides of a wrap-around porch. You are above the clouds. We wondered how this place was still available to be rented on rather short notice. In some ways I hate to build this place up so much because we want to return. We want it to be available. But, I am honest and must give credit where credit is due. Our group was 16-62 years old...we were never bored. We never watched TV. We visited the local town, walked along a stream with a cat who adopted us. We rented a pontoon boat on a gorgeous lake. It was brand new, 46 ft. that would pull a skier. We liked it so much we did it again. We played games in the game room. When we went to bed, we could not hear our kids playing loudly below us, it was wonderful! The master bed I wanted to take home with me...never slept better! There were some small problems that the owner remedied the same day, our ceiling fan was dusty and got cleaned. There were a few others that were not significant because I can't remember them. The owner was always the consummate professional. As far as remote goes, I don't think I would want to be any more remote. You could sit on the deck with no clothes on, if that is your wish, no one would notice. Rent it. Sit on the deck. If you don't like the view just wait. It will change very soon. I give it 4 stars ****. Great place to stay if you want to get away from it all. Well maintained and very scenic. You are above the clouds awesome sunsets every day! We are located just 12 minutes from the new Harrahs Casino. White water rafting in the Ocoee and the Nantahala are within a short drive as well as ATV trails.